Comment on the meeting Farmers and Nature, SNH, 18 May 2018. Inspiring examples: holistic, diverse, innovative. Current support unfitting. Long supply chains need disrupting. Result-based payment a way forward. B for A and A for B.
Inspiring examples were heard today of a commitment to farming and wider land management by five different people and enterprises . The aim of this SNH-sponsored meeting – Farmers and Nature: promoting success and looking forward, 18 May 2018 – was to get people to share their experiences of managing land for the long term and for a range of economic and environmental outputs. All five speakers agreed that just taking from the land was not feasible, but that ecological regeneration and maintenance were essential for a future. There was little prosaic description of what not to do. Rather, the day was a set of inspired personal accounts by people operating outside the expected norms of agricultural management and long food supply chains. Fig. 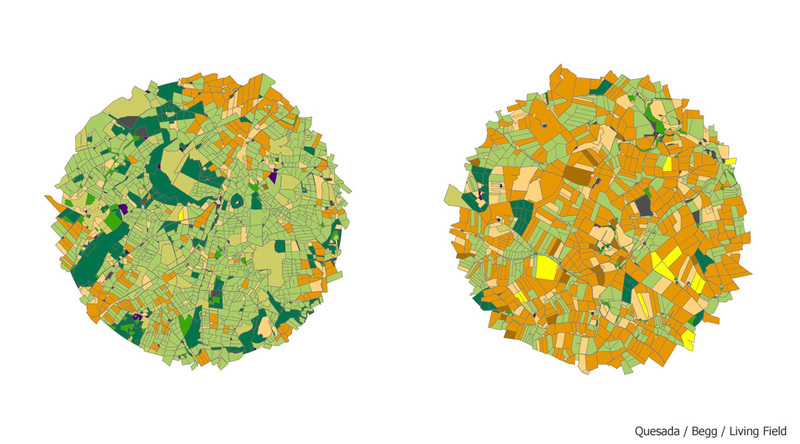 1 Contrasting lowland landscapes, fields mapped in colour: greens representing various types of grass, orange cereals. Prepared by Nora Quesada and Graham Begg for the Living Field web site. Diversity of landscape and land use (Fig. 1) means that no one set of prescriptions can be applied to gain environmental benefit in farmland. Flexibility is needed to allow local adaptation to solve local problems, as was heard. Speakers were: David Aglen, Balbirnie Home Farms , specialising in combinable crops, veg and potatoes, grass for suckler cows and forestry; Bryce Cunningham, Mossgiel Farm  producing ‘non-homogenised milk, by Ayrshire cows grazing the historical pastures of Robert Burns’ and in doing so disrupting the established the long and convoluted supply chain for milk processing and marketing; Lynn Cassels, Lynbreck Croft  producing hens, pigs, cattle and bees and also planting trees, in what many would class as difficult land and climate; Roger Polson, Knock Farm, Hunty  running a mixed organic enterprise with suckler cows, breeding ewes, livery horses and spring crops; and Teyl de Bordes, Whitmuir Estate, near Selkirk , creating opportunities and support for a wide range of plants and animals in mixed farmland. Links to their work and presentations on the day via YouTube can be found near the bottom of the page [2 to 6]. The speakers saw themselves as far from the mainstream. It was not just that they thought themselves on the fringes, but that their neighbours and peers thought they were. Yet to me their philosophy and practices are examples of what will be central to a sustainable future. They are innovators, not complying with what is expected of farmers and crofters in the early 21st century. It was encouraging also to see some disruption of the long supply chains that force farm profits down and the decouple land from the consumer. Fig. 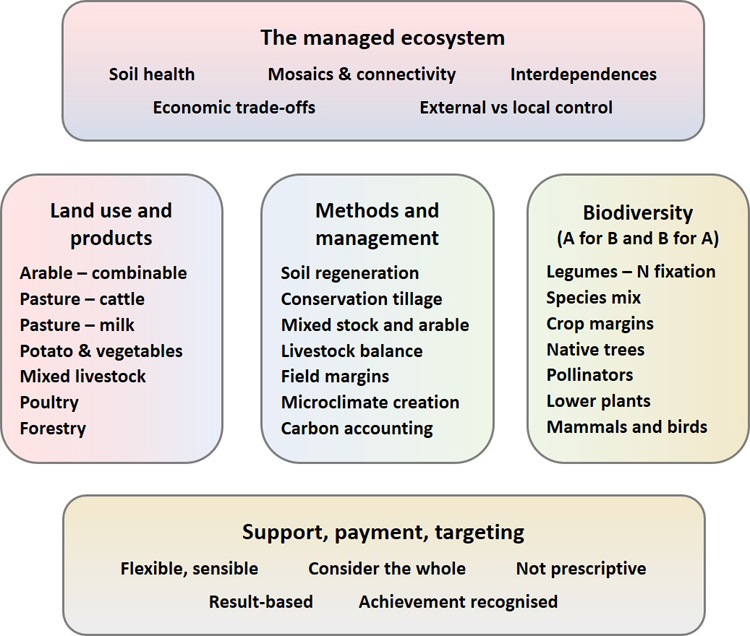 2 Some of the topics at the meeting, from general characteristics of a managed ecosystem, through products, methods and biodiversity, to criteria for support, payment and targeting. A for B is Agriculture for Biodiversity and B for A is Biodiversity for Agriculture (not presented in this form but highly relevant, see text below). Several general threads recurred among these examples, brought out both in the talks and in discussion (Fig. 2). One was the need to manage land holistically and over time and space rather than concentrate on one product that satisfies immediate economic demands. Most of the farms and crofts managed a range of saleable products and all farmed for the long term, despite having to overcome physical and sometimes economic hardships in the short term. ‘Work with nature not against it’ was the recurrent message: a hackneyed phrase some may think, yet true nevertheless. In the concepts discussed in these web pages, ‘working with nature’ implies managing multiple channels for the balanced flow of natural resources to soil, plants and animals . Another was innovation – re-thinking how to do things. Farming did this in a big way during the Improvements era in the 1700s and in the Agricultural Expansion Programme in the late 1940s. In both instances, change was needed to overcome stagnation and reverse decline. Examples presented here included sowing tramlines to hinder surface wash after rain, and so slowing the erosion of soil and loss of fertiliser as pollutant, and encouraging nitrogen-fixing legumes back into grass swards. Hardly innovations, you might think. But just look at the areas of compacted mush around most farm gates, and next time you see a mud-on-road sign, imagine where the mud came from; and then look at the imports of nitrogen and plant-protein to Europe due much to the cumulative loss over the last 150 years of home-grown legume pulses and forages. You can imagine also that some of the practices would have been seriously debated at farmer-scientist meeting in the 1750s – running sheep on winter wheat when grass offered poor pasture was one, with little stated detrimental effect on the wheat (Balbirnie). Support and conditions for agri-environment schemes formed a third thread (Fig. 2, lower box). Schemes were too inflexible, too prescriptive, for example in terms of dates that things should be done by, and schemes rarely confirmed that a desired result had been achieved. Payment for result, specified in terms of populations and other ecological states was preferred and would ensure that public money led to a demonstrable, beneficial change. And a fourth was the need to disrupt or bypass existing, mostly long, supply chains whose complexity determines, often obscurely and perhaps from thousands of miles away, what must happen on the farm, while the grower and manager has limited reward and control. The solution is to replace the long chain with a much shorter one from field and farm to consumer in one or two intermediate steps that involve retaining the production and marketing processes within the enterprise (Fig. 3). The experiences of Mossgiel Farm are a lesson. Fig. 3 Diagram of production and quality chains: production is buffered by operating across several different enterprises (F1, F2, etc.) 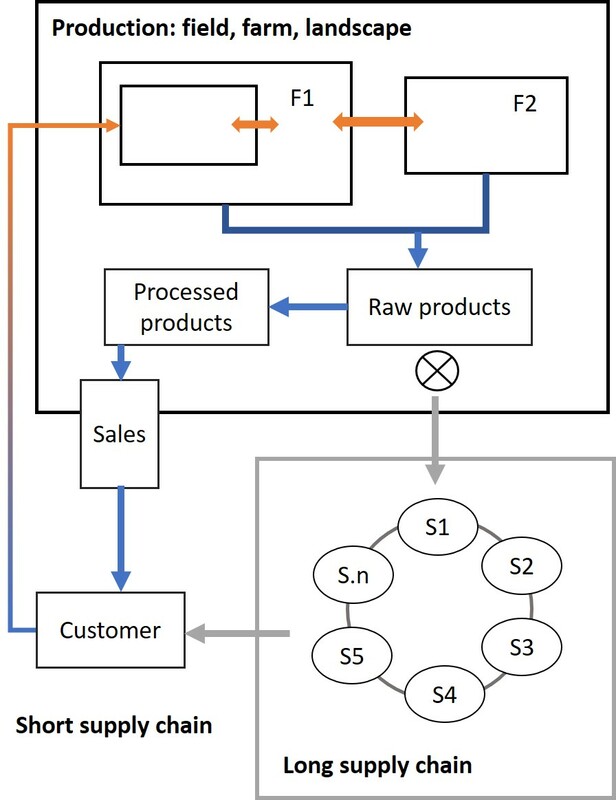 that are interconnected in terms of the flow and sharing of resources over seasons and landscape; the short quality- or supply chain keeps processing and sometime sales within the enterprise (upper large box), adding value to the product and control to the grower, after bypassing an existing long chain. Design of supply chains is a main part of the EU project TRUE . Teyl de Bordes introduced some examples of Result-based schemes in Europe in which farming is paid for delivering specified environmental benefits. Kirsten Brewster, from SNH, who organised the meeting and Teyl de Bordes since wrote a summary of six Results-based pilots. Here is an extract from their introduction. Result Based Agri-environment Payment Scheme (RBAPS) pilots “Results-based” is a term used to refer to agri-environment type schemes where farmers and land managers are paid for delivering an environmental result or outcome, e.g. number of breeding birds, or number of plant species in grasslands, with the flexibility to choose the management required to achieve the desired result. The report by Brewster and de Bordes gives descriptions and links for each of 6 pilot studies and is downloadable as a PDF . A distinction not discussed specifically at the meeting but one that is highly relevant to the design of future support, joins Agriculture (A) and Biodiversity (B) in two directions . A for B is where agriculture, either inherently or by alignment, fits its methods and management to support certain life forms such as rare plants, invertebrates or birds. B for A is where essential life forms have to be maintained in a good functioning state for agriculture to continue sustainably. Examples of B for A include microbial transformations in the soil and the broadleaf weed (= wild plant) flora supporting predatory organisms that suppress pests. Most existing schemes and support operate A for B, but in doing so almost exclusively, they do little to encourage the sustainability of agriculture. A topical example is the argument around legumes such as peas in CAP Greening. Peas bolster a wide range of ecological processes – N-fixation, allowing a diverse dicot weed flora and enriching the habitat mosaic – yet the main and possibly only purpose of pea crops in greening measures is to be in the ground at a certain date in summer. Whatever weighting is given to A for B and B for A, most of the ecological processes operate at scales well beyond the field. Such is the diversity of land use in the lowlands (e.g. Fig. 1) that landscapes of only a few km diameter may need specific measures. Flexibility therefore and payment for results, not blanket prescriptions, should be the basis of future support. Farmers and nature: promoting success and looking forward. Click the following links for Agenda and Speakers and the Presentations. David Aglen, Balbirnie Home Farm. Web: http://www.balbirnie.com/people. YouTube video of presentation: Regenerative agriculture at Balbirnie. Bryce Cunningham, Mossgield Farm. Web: mossgielfarm.co.uk Presentation on Youtube: The challenges of breaking the mould. Roger Polson, Knock Farm Presentation on YoTube: Managing Knock, a holistic approach. Teyle de Bordes, Whitmuir Estate: Twitter: https://twitter.com/whitmuir1?lang=en. Presentation on YouTube: Recording nature on the farm. Crops, grass and management open or restrict channels through which energy and nutrients flow to sustain a managed ecosystem’s various parts. See Crop Diversification at the Living Field, also . Diversity of practice is the key – maintaining to the soil and the wider food web of both invisible and visible biodiversity. Narrow the diversity and a single product might prevail, but the system fragments. Result Based Agri-environment Payment Scheme (RBAPS) pilots: K Brewster and T de Bordes, 31 May 2018. Click to download PDF BrewsterdeBordes-resultsbasedagrienvtrials. The EU H2020 TRUE project is actively developing short supply chains for legume-related crops and products. the project has much in common with many of the the sentiments of this meeting. More on TRUE on these web pages at Transitions to a legume-based food and agriculture where there are also links to the TRUE web site. The concept A for B and B for A (A = Agriculture, B – Biodiversity) which draws a workable distinction that could be introduced to future support, has been widely promoted by the agroecologist Paolo Barberi from the University of Pisa. Scottish Natural Heritage organised the meeting. Contact: Kirsten Brewster, Kirsten.Brewster@snh.gov.uk. Kirsten Brewster and Teyl de Bordes provided access to their article on Result-based schemes, with thanks. This article is an offshoot of work on crop diversification and food quality chains in the EU H2020 TRUE project based at the James Hutton Institute, Dundee. Views are those of the author, Geoff Squire: geoff.squire@hutton.ac.uk.